Excavations at Great Whelnetham are now complete, but for the archaeologists who participated on the project, the work is far from over. The dig at Great Whelnetham, near Bury St. Edmunds in England, was in preparation for residential development, but it wasn’t supposed to yield very much. 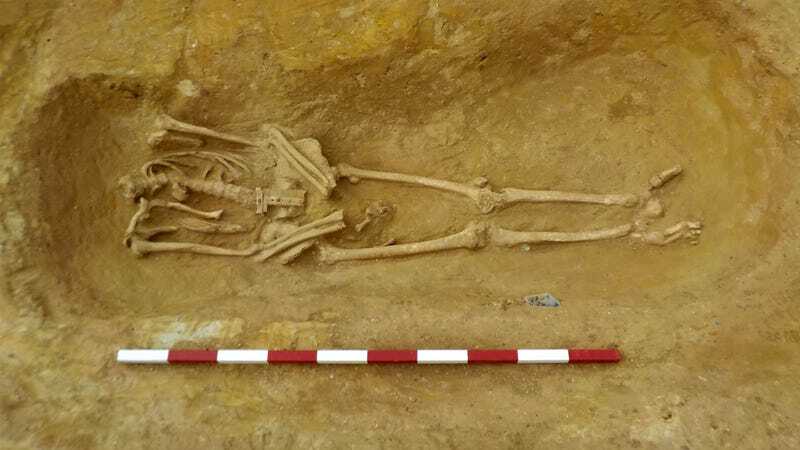 The geology of the area consists of very fine sand, which doesn’t lend well to the long-term preservation of bones, explained Andrew Peachey, the lead archaeologist behind the project, in a radio interview with the BBC. Soon after excavations began, however, the Archaeological Solutions team uncovered two poorly preserved Roman skeletons near the surface, prompting further investigation. Then they found another skeleton. And then another, and another. Archaeological Solutions team members at work at the Great Whelnetham site. 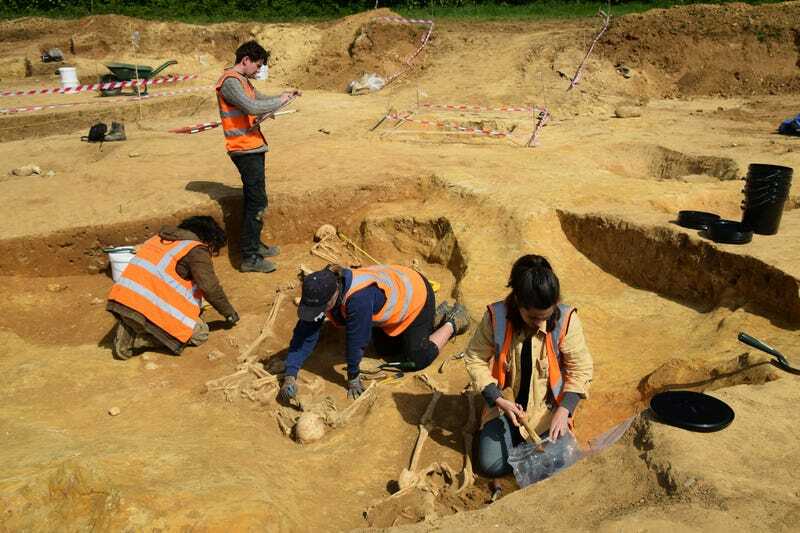 In total, the team uncovered 52 skeletons at the 4th century AD site, of which a surprising proportion—around 40 per cent—were missing their heads, as the East Anglian Daily Times reports. In total, around 60 per cent of the skeletons uncovered at Great Whelnetham were classified as “deviant,” that is, burials inconsistent with conventional Roman practices (such as laying the dead on their backs). Peachey told the BBC that the skeletons, though decapitated, were not without their associated skulls. Some of the skulls were tucked under legs, some placed between feet, or laid at the bottom of the grave, and yet other skulls were found alone without the rest of the body. The cemetery contained skeletons belonging to mixed population, including one small child and two to three kids around the age of 10. Most had lived to middle age, both men and women, and some were quite old. Some skulls were tucked under the legs. In most Roman-era cemeteries in England, archaeologists expect to find some culturally unconventional burials, but as Peachey told the BBC, it’s quite rare to find such a high proportion of deviant burials at a single site, suggesting the presence of a specific population with a specific burial tradition. These so-called deviant burials were likely not deviant to those who participated in them. Speaking to the BBC, Peachey said there’s “nothing particularly macabre” about the burials, and that they weren’t the result of executions. The heads were carefully removed after the individuals had died, and cut from the front just behind the jaw. 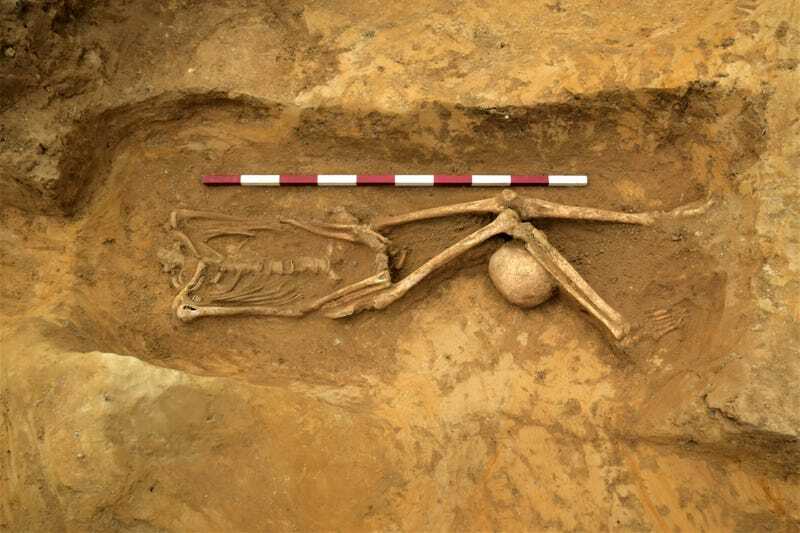 Peachey said his team is still analysing the skeletons to understand more, “but we can only speculate on why this ritual might have taken place,” he said. During this period, the Romans tried to remove local traditions and supplant them with their own, but some communities resisted, holding on to their cherished beliefs and rituals. This might be an example; some indigenous English cultures venerated heads as part of the soul, leading Peachey to wonder if this could explain the strange burials seen at Great Whelnetham. Another possibility is that this population came from a different part of the world, bringing a unique burial practice along with them, he told the BBC. To test this possibility, Peachey’s team is planning to conduct an isotopic analysis of the bones to determine where this population may have originated. An intriguing possibility is that these people were slave labourers, Peachey told the BBC. Their relatively good health, as seen in the bones, is a possible indication of this, as slaves were a valuable part of the working population and an “expensive commodity,” he said. It’s possible these people originated from somewhere in Europe or elsewhere, and were brought to England by the Romans to work in the settlement. Indeed, a striking feature of the skeletons is how healthy and well built these people were. They had “incredibly well developed muscular arms and upper body,” Peachey told the BBC, a potential sign of agricultural work. They had access to a plentiful diet including sugars and carbohydrates, which likely contributed to their poor dental hygiene, including dental lesions, abscesses, and tooth loss. But for the most part their teeth were very well healed. Some skeletons exhibited signs of tuberculosis, which was common among agricultural populations at the time, according to the East Anglian Daily Times.